Back in 2006, a time traveling elephant visited London, on command of an eccentric rich sultan who was seeking to find another similar time traveler in the form of a young girl who was haunting his dreams. Well, you all know the story. 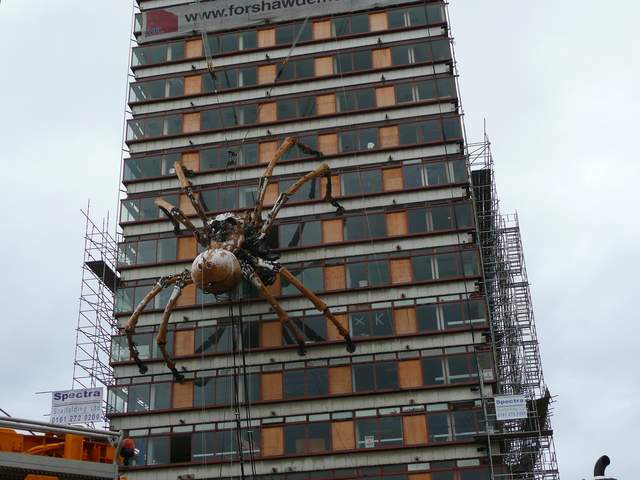 And now, new agents used on a building due to be destroyed in Liverpool has created a creature we all know and love, only just ever so slightly bigger. About, 40ft bigger in fact (although the sizes seem to get larger every time I hear them). Royal De Luxe, or rather La Machine as they seem to now be called have let a huge 40ft spider loose on the streets, and indeed buildings of Liverpool. And there”s no way I”m going to miss something like that! She goes by the name of Princess (ahhhh), and she started out in a cocoon on the side of Liverpool Lime St. Station last Thursday. And she is definitely magnificent, if, y”know, freaky as hell at night time. As soon as I left the station though, memories came flooding back of the crack-addled elephant worshipers of 2006. Children and adults alike all filtering out of the station with only one purpose in mind. 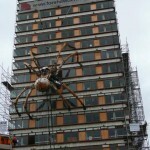 “Have you seen the spider?” “Where is the spider?” “Hey, dude, like, stop hogging all the Pringles.” Not the last one. The media has worked its magic, and everyone knows about Princess. Everyone wants to meet her, and we all want to be her friend (through fear of being kept alive in some kind of spider-feeding larder deep underneath Liverpool station before being eventually chewed on by gammy spider-jaws, I”d guess). And the crowds are huge. They”re expecting over a million people over the three days, and I counted at least 200 today. People line the streets everywhere, and if you’re unfortunate enough to get stuck in front of Princess (as I was) – you will die (I was lucky). I’m not kidding, as we all tried to move out of the way of the incoming spider, and people behind us just wanted to get closer and stand in the way … Someone actually, genuinely, and I”m not lying here, shouted “think of the children!”. And sadly they weren”t joking either, there did seem to be panic brewing among the group of, shall we say “dads”, children were leaving crying, men with pushchairs were looking angry, and apparently some Liverpudlians just need to relax. Still, we made it out alive, the spider didn’t eat us – and I’m actually rather looking forward to collecting other prominent phrases like “we’re all going to die” and “oh, the humanity”. Speaking of crowds, don”t worry, Liverpool has opened all three of its restaurants for this event, and you will only need to queue out the door and down the street for 30 minutes. I”m sure it”s always like this. Really.